By Melissa Lennig on June 13, 2017 3 Comments. This content contains affiliate links. As an Amazon Associate I earn from qualifying purchases. Inside: Replacing cracked sand toys year after year is a waste of time and money. 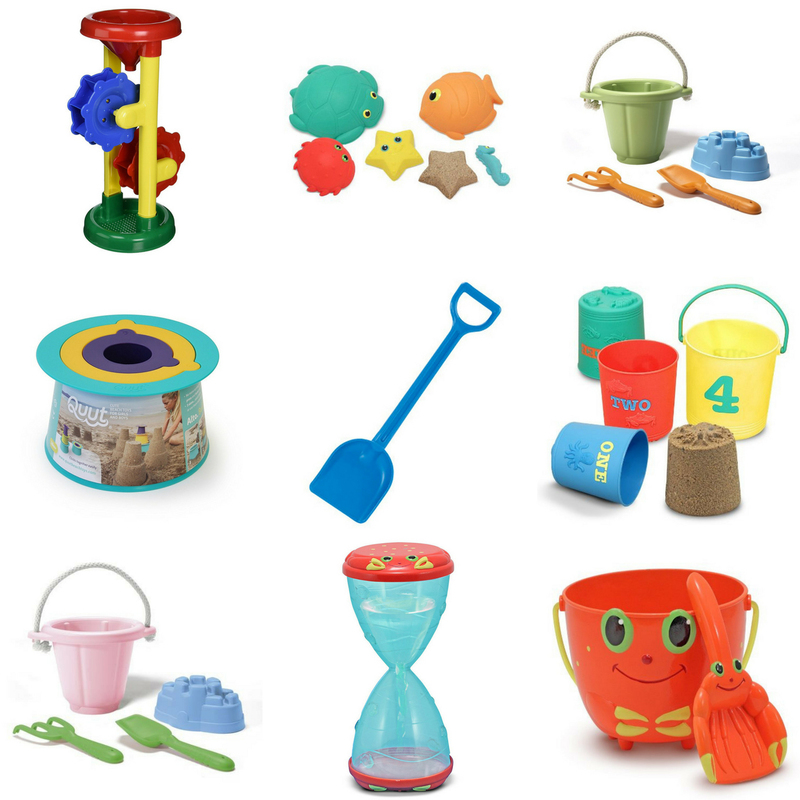 In this post, discover the strongest and cutest sand toys for kids of all ages. On hot summer days, we love to pack a bag and head for the lake. My boys could spend all day splashing in the cool water and digging in the sand. And as cliché as this might sound, I get to relax in a beach chair with a good book. On days like this, a broken sand toy can be a major bummer for kids. About eight years ago, I purchased our first—and only—round of sand toys. The toys shared below have lasted through hard play with two boys, many little friends, and eight incredible summers. Buy sand toys once and enjoy them for years to come! The best basic sand toys for digging, dumping, and shaping sand. Like most sand wheels, this one works best with water or dry sand. It breaks apart for easy storage. Shaping sand is a classic activity. These sand molds are thick and sturdy! This was the first sand play set I purchased for my kids. Eight incredibly active years later, it is in practically perfect condition. If you are going to invest in sand toys for your children, this set is a must-have! 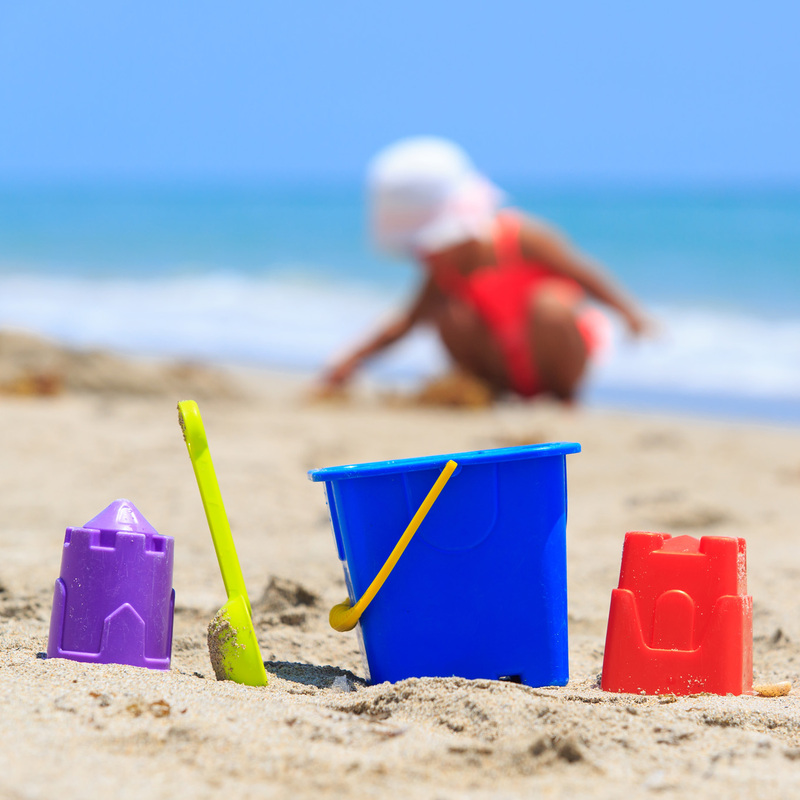 Three pieces, perfect for building sand castles! 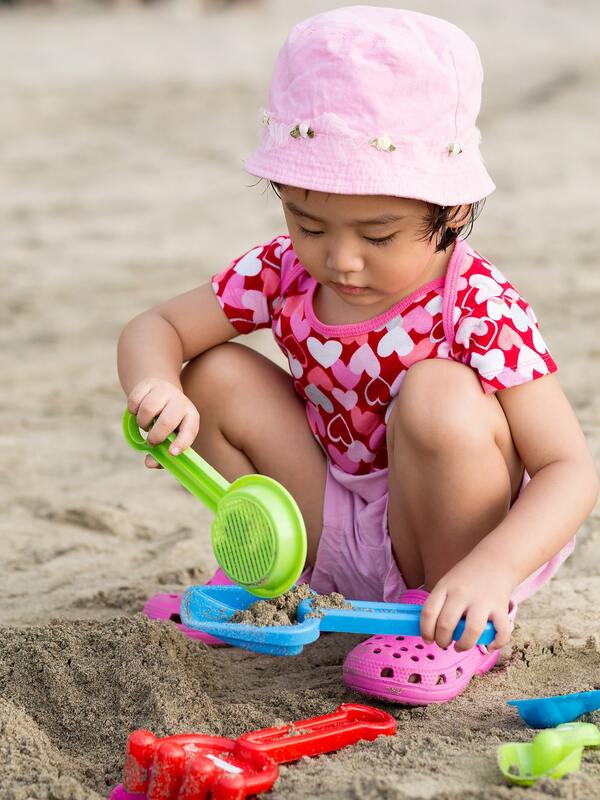 When we bring our sand toys to local parks and beaches, the other kids always go for our Hape Mighty Shovels. My boys grudgingly share them! My kids love this toy! I highly recommend. This set is as strong as it is cute. 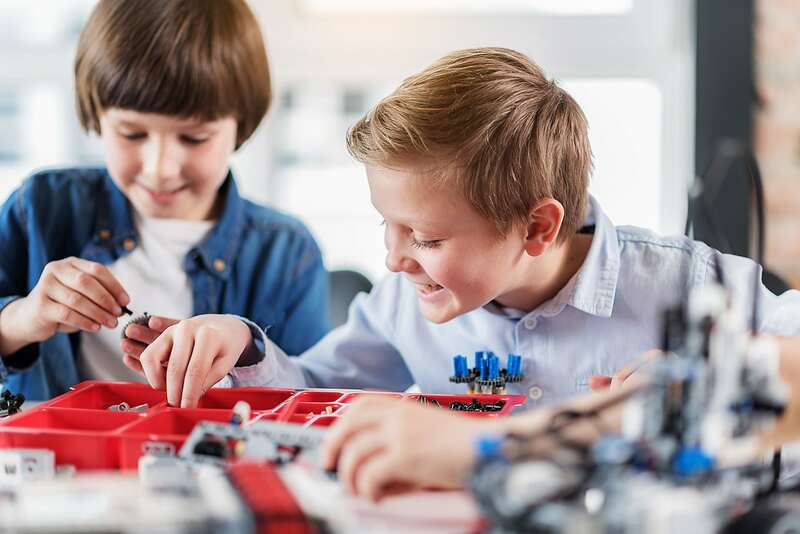 Shared below are our favorite toys for imaginative play. Perfect for making delicious sand cake! This set is so much fun for imaginary play. Be prepared for an all you can eat sand cupcake buffet! This play set is my favorite! I could scoop sand ice cream all day! This toy is so unique! My kids enjoyed pretending they were searching for skeleton pirates. I love the bright measuring cups, whisk, and spoon included with this set. My boys like these litttle characters for their sand castles. This one is fairly new to us, but it’s holding up well. The boys enjoy using it to make walls around their sand castles. Forget the kids…I want to play with this all afternoon! 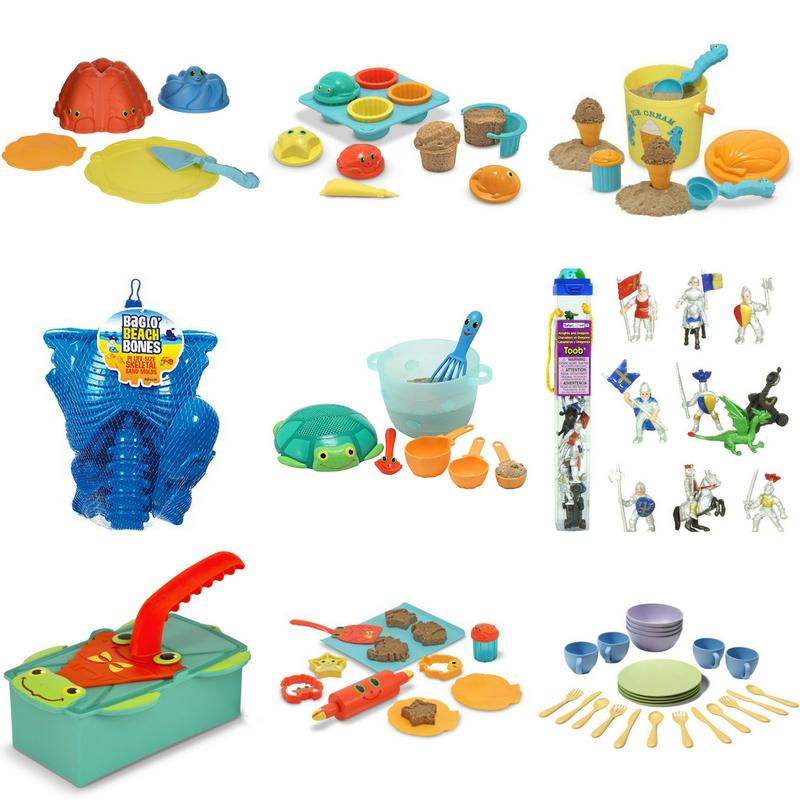 We love to bring this dish set to the beach for imaginative play. 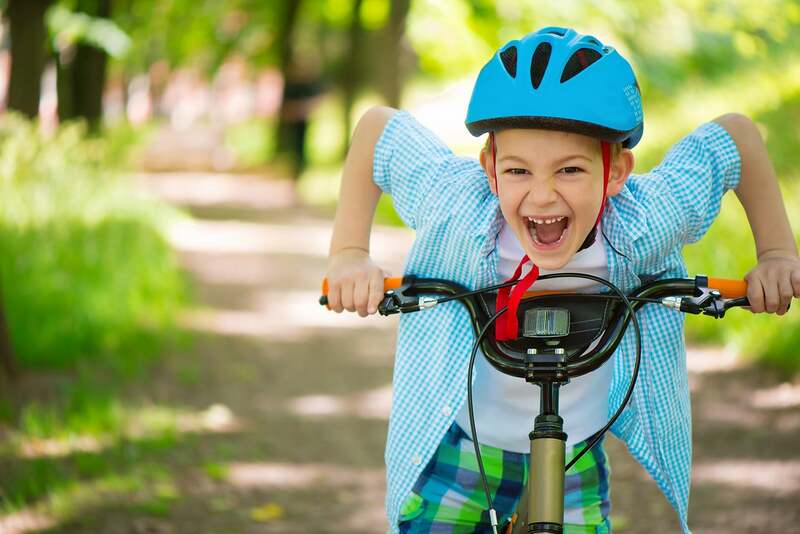 For the beach, park, or lake, we really prefer our Green Toys vehicles. Made from strong recycled plastic, they float in water and resist cracking and fading. Suited for outdoor play, this truck awesomely carries sand, rocks, or whatever your kiddo wants it to! Perfect for towing sand, pebbles, and shells. Perfect for land or water. This toy is so cute! My youngest guy loves driving the mini cars into the ferry and floating if off into the lake. 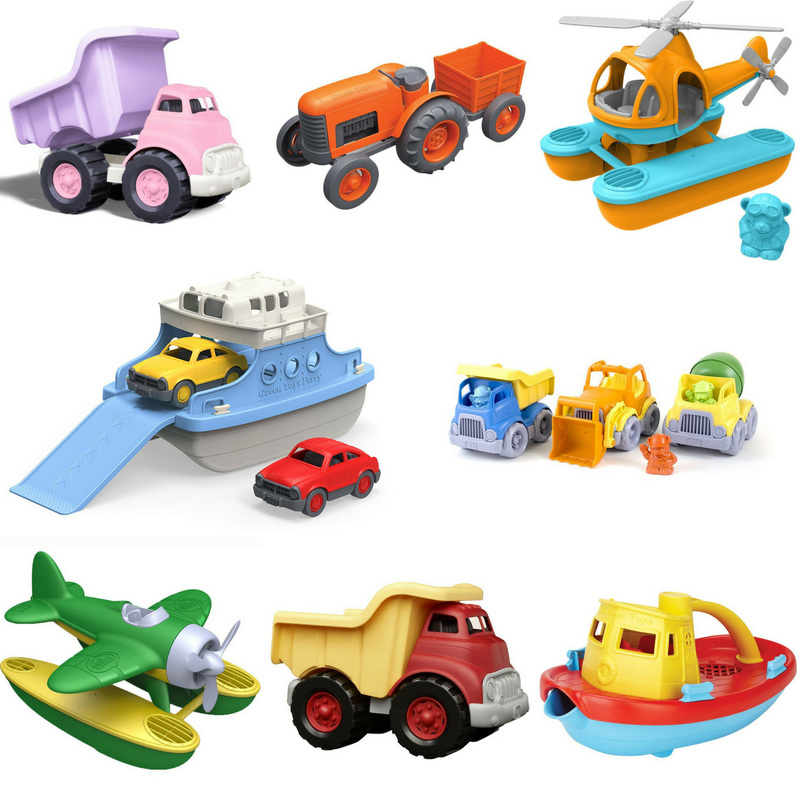 These vehicles are perfect for little hands! A plane that flies, floats, and drives? Just awesome. We keep one in our bathtub for play and shampoos, and one in our bag of sand toys. The way I see it, purchasing high-quality sand toys once saves money and prevents pounds of worthless, broken plastic from entering the landfill. 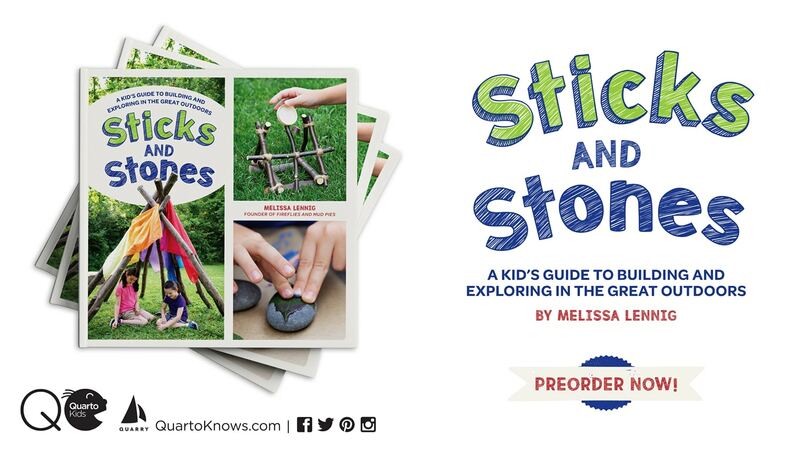 Click the images below to view more of our favorite toys, books, and games for kids. I can’t thank you enough for this list! I’ve LITERALLY been looking for the Hape Mighty Shovel for a year, and no one could remember where our preschool got it from 🙂 Thanks for sharing! You are welcome! All the toys on that list are the BEST!